DATA ANALYTICS: ARE CLOUD-BASED BIG DATA SOLUTIONS WORKING? Nowadays modern companies have access to more data than ever before. But to take a competitive advantage is necessary to store, analyze and exploit all data quickly and correctly. Among the various tools available to companies, the cloud-based solutions are getting more and more consensus. But do these solutions really represent a smart investment for the company? To answer this question, Oracle and Intel commissioned to Forrester™ Consulting to evaluate the effect of the cloud on data analytics activities. 98% of companies reported that their current data and analytics investment are creating benefits, regardless of how it is done: in a traditional way or with cloud-based solutions. 82% of interviewed believe that, in order to stay competitive, they need to access to more and more data, but the study also shows that 79% of interested parties said they needed more agility to properly manage all the collected data and all the elaborated information. 84% of companies confirmed that having the entire layer of data analytics technology in a single technology partner, with an integrated set of data management and analytics service, is a critical or high priority in their plans. The companies interviewed mainly identify four benefits of having the full set of tools offered by a single vendor into the cloud: cost decrease, better integration of tools, limited loss of information due a higher level of security, reduced time-to-value. 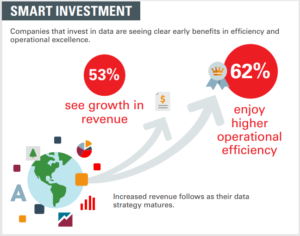 53% of companies that invest in data analysis reveal instant benefit in efficiency level, which is reflected in revenue increase, while 62% of companies reveal improvements in operations activities. 80% of respondents believe the cloud is solution of data collection in the next future and want to move their big data and analytics into the cloud. But currently only 14% of data management, processing and data analytics happens in the public cloud today. However, the fastest-growing companies are also the earliest adopters of the cloud for big data. 65% of IT professionals believe that barriers to cloud for big data are manageable, especially the obstacles connected to the security of data and information. At the end, companies need tools to support their data analytics activities, but very few firms have the skills and the business case to keep up with the blazing speed of big data analytics innovation. The cloud providers are leveraging scale and expertise to deliver more capability at a much lower cost and frequently the internal IT office cannot compete with a private cloud solution. Technology partners are playing an important role in the market and they have the skills and the right tools and solutions, integrating with each other, to correctly support the companies. In any case, the choice of relying on cloud-based technologies should not be taken with superficiality because it requires a redesign of the technological infrastructure architecture and applications, in addition, companies that want to collaborate with a technology partner have to reprogram all the procedures and the “way of thinking”. But what companies need to know is that technology partners are there, they are competitive on the market and they are ready with all skills, know-how and experience needed to support customers.